Make a Splash with These Kitchen Tiles — KTJ Design Co. The kitchen backsplash is one area in a kitchen remodel you can really splurge. The area from the countertop to the bottom of the cabinets is 18”, so you don’t have to purchase a whole lot of material to make a big splash. And we suggest this is the place where you splurge. These five tried and true tile styles will give you the ultimate WOW factor for your kitchen. Don’t be afraid to go wild and be bold. Forget about playing it safe, if you see a tile that makes your heart skip a beat – then go for it. 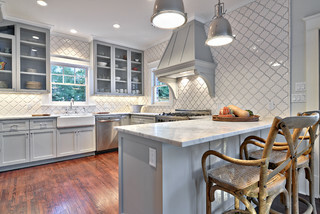 If you do want to play it safe then go with the classic subway tile, but maybe punch it up a notch with a beveled edge, or a glass subway tile. You can check out two kitchens with nice classic subway tiles here and here. But we really like this glass subway tile. It is a little larger than typical and slightly beveled. Of course the colors are so on trend. Tile your backsplash in all the same color, or mix it up and use all three. Come see this sample in the Design Workshop. We are seeing all the major tile manufacturers come out with their version of the Arabesque or Moroccan tile. They are the feel good tile. It appeals to both men and women. This may seem too trendy for you, or you might think it will be dated quickly, but I think this pattern has been around for since the Byzantine times, so you are pretty safe. We like this sample (come see it in the Design Workshop). I haven’t installed it in any kitchens yet, but here are a few great ones over on Houzz. Once again we are seeing a new twist on the chevron pattern. I know there are many designers out there who are over this pattern, but I like it and think it will be here for a while. We just received this tile in the Design Workshop and I like the mix of ceramic, stone, and glass. This will add multiple layers of texture (not to mention a great pattern). We just finished a kitchen with a fantastic mosaic tile and I have to say it is gorgeous. Here is a picture I took with my iPhone (professional photographs in production). Pick any one of these great tile styles for your kitchen backsplash and your kitchen will have the WOW Factor you have been graving. Remember don’t be afraid to be bold! Download this ebook on all things kitchen!